Jun Shihan Robin McColley moved to the Ithaca area in 1991 and began her training in Seido Karate in May, 1993. She achieved the rank of Shodan (1st degree black belt) in 1996, and began teaching basics, kumite, and kickboxing classes for both adults and children. Jun Shihan Robin has been a direct student of Kaicho Nakamura since 2003. She was promoted to Rokudan (6th degree black belt) in 2018. In 2005, she started the Trumansburg High School branch of Cayuga Lake Seido Karate in the form of a credit-bearing course offered through the physical education department as well as a student-run club. Beginning with only nine participants, the program has now grown to more than 45 high school students who can take class every day or every other day as part of their schedule. She also runs an after-school program in Trumansburg for children ages 5-12. Jun Shihan Robin has twice won the Sogo (overall) championship at the annual Seido Benefit Tournament. In 1996, she qualified as a member of the USA kumite team where she finished 4th among a large group of international competitors. She worked with other high ranking black belt women to offer workshops during Seido's annual Women’s Seminar, and helped to organize Seido’s 30th Anniversary (Saiten) in 2006 and 40th Anniversary (Goen) in 2016. Jun Shihan Robin has a bachelor’s degree in Physical Education and a Certificate of Advanced Study in Education Administration from SUNY Brockport, and a master’s degree in Exercise Physiology from Springfield College. She holds New York State teaching certifications in Physical Education and Health, and has been certified in CPR, First Aid and Lifeguarding since 1995. Jun Shihan Robin is currently the Dean of Students at Trumansburg High School. She is also a member of the American Women’s Self-Defense Association. Jun Shihan Gail Lajoie began training in Seido Karate in 1993, achieving the rank of Shodan in 1996. In that same year, she began teaching classes for adults and children. 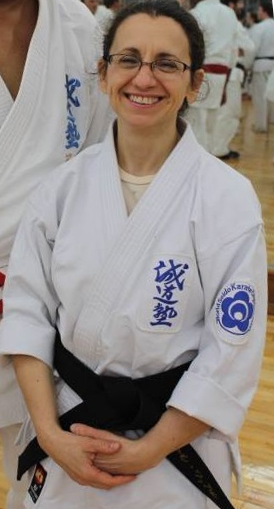 She became a direct student of Kaicho Nakamura in 2003, and received her 6th degree black belt in 2018. In addition to teaching classes at Cayuga Lake Seido Karate, Jun Shihan Gail also teaches classes in Seido Karate and Personal Defense at Ithaca College and Wells College. She travels regularly to New York City to continue her own training with Kaicho Nakamura and Nidaime Akira Nakamura. Jun Shihan Gail is a frequent participant in the annual Seido Benefit Tournament, most recently winning the Women’s Master’s Kata division in 2010 while placing second in both the free fighting and breaking competitions. She also participates regularly as a judge of kata and kumite, and helped to organize Seido’s 30th Anniversary (Saiten) in 2006 and 40th Anniversary (Goen) in 2016. Jun Shihan Gail has also had the opportunity to participate in clinics, classes, and tournaments across the US, South Africa, and Japan. She also holds instructor certifications in Conflict Resolution and Self-Defense. Jun Shihan Gail has both a bachelor’s and a master’s degree in Music Education from Ithaca College, and a Certificate of Advanced Study in Education Administration from SUNY Cortland. She holds New York State teaching certifications in Music and in School District Administration. Throughout her 24-year career in education, she worked as a teacher at both the elementary and secondary levels and was a provider of staff development and support for teachers. She is now a full-time karate instructor and small business owner. Senpai Jennifer Kraft-Maza began training in Seido Karate in 2007 after only 3 months of observing her oldest son participate in the program. Her youngest son joined them in 2009, and they have been training together ever since! In 2017, Senpai Jen achieved the rank of Sandan (3rd degree black belt), making her the first student of Cayuga Lake Seido Karate to progress from the rank of white belt to the rank of Sandan. 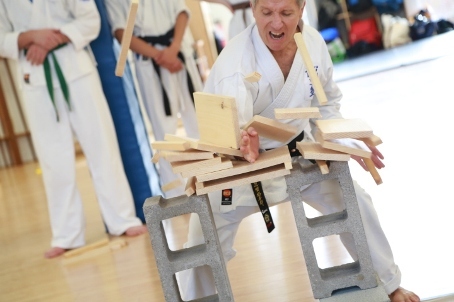 In 2011, she placed second in the tameshiwari (breaking) competition at the 35th Annual Seido Benefit Tournament. Senpai Jen has been teaching karate since 2010, and has been the instructor of our Dryden program since 2013. She is also a certified instructor of Self-Defense, assists with supervising kyu belt promotions and is a tireless volunteer when organizing dojo events. Senpai Jennifer is a graduate of Juniata College, where she received a Bachelor of Science degree in biology/zoology. She then attended Ross University School of Veterinary Medicine and graduated with a Doctor of Veterinary Medicine in 1997. Before moving to the Ithaca area, she worked for three years in private practice in Rochester, NY. She currently resides in Freeville, NY, with her husband and two sons. Senpai Jen owns a small animal veterinary house call practice which services parts of Tompkins and Cortland counties. 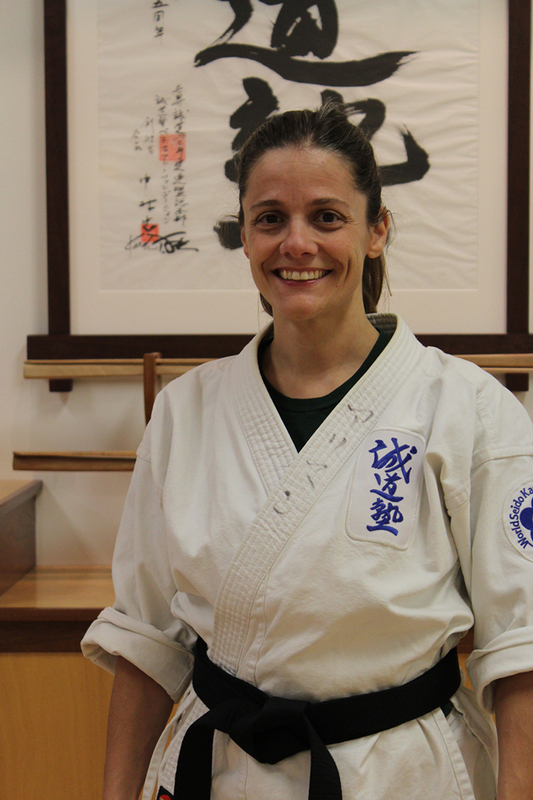 Senpai Amelia Massi moved to the Ithaca area in 1991 and began her training in Seido Karate in October of 2007. She achieved the rank of Sandan (Third Degree Black Belt) in 2019. Amelia became an instructor of junior students in 2013. She also assists with supervising kyu belt promotions and enjoys volunteering to organize dojo events. Senpai Amelia earned her Bachelor’s Degree in Physical Therapy from SUNY Upstate Medical University, Syracuse, NY in 1983. She is currently a part-time physical therapist and volunteers at several churches and with various youth organizations in the Ithaca /Lansing area. A mother of three, she currently resides in Lansing, NY, with her husband and family. Senpai Debbie Bosanko is a certified group exercise instructor who has taught exercise classes since 1993. In addition, she has been certified by the Aerobics and Fitness Association of America (AFAA) since 1994, a certified personal trainer since 1998, and a certified kickboxing instructor since 2007. She enjoys helping others get in shape and stay in shape. In addition to personal training, Senpai Debbie teaches several classes that help people 55 and older stay fit, as well as a class designed specifically for people who have Parkinson’s disease. Senpai Debbie has been a student of Seido Karate since 2008, and holds the rank of Sandan (3rd Degree Black Belt). She has been an instructor of PeeWee and Junior students since 2011. Senpai Debbie holds a master’s degree in Therapeutic Recreation from SUNY Cortland. She is married and has two active boys. Pete Bosanko moved to the Ithaca area in 1984. He has been a student of Seido Karate since 2010, when he decided to stop watching his family train and joined them! He has previously studied Aikido, and is particularly fond of the rolls, falls, and grappling techniques that we practice at the dojo. Pete has been a professional software engineer for more than 30 years, and currently manages an IT team at Cornell University. Pete holds the rank of Nidan (2nd Degree Black Belt), which he earned in 2018. He has been an instructor of PeeWee and Junior students since 2016. He lives in Lansing with his wife and two boys. Nora Schapira began training in Seido Karate in 2008, following her younger son Nico who began his training the previous year. She achieved the rank of Shodan (1st Degree Black Belt) in 2016. Since 2013, Nora has co-coordinated day camps and several other dojo events. She began assisting with PeeWee and Junior classes in 2017. Nora holds a Bachelor’s Degree in Production Organization from Universidad Argentina de la Empresa in Buenos Aires, a Bachelor’s Degree in French from Southern Oregon University, and a Master of Arts in Teaching from SUNY Empire State. She holds New York State Teaching Certifications in French and Spanish. Since 2012, she has been a teacher of world languages at Lehman Alternative Community School in Ithaca. She lives with her family in Lansing. Allison Peet has been training at CLSK since the fall of 2011. She earned her Shodan (1st Degree Black Belt) in 2017. She has been an assistant instructor of Junior and Youth students since 2016. Allison most appreciates the spirit of the Seido family, and enjoys visiting and training at Seido dojos around the country. Allison works as a Mathematics Instructional Specialist at TST BOCES where she supports teachers and administrators throughout the region. Allison holds a Bachelor’s Degree in Elementary Education from SUNY Cortland and a Master’s Degree in Special Education from LeMoyne College. She is currently enrolled in Stonybrook University’s Educational Leadership program. She is excited to use her background in education to support the PeeWee, Junior, and Youth programs at CLSK.